^ a b c d e See Battles of Lexington and Concord and Siege of Boston infoboxes for details on force counts in this campaign. ^ See e.g. Cushing (1896), p. 58, where Gage describes Crown appointees being harassed out of several towns. ^ See Fischer (1994) for a comprehensive treatment of Lexington and Concord. ^ See Arnold Expedition for details on the forces Arnold took on this expedition, and its outcome. ^ Frothingham (1886), pp. 395-419, in which colonial assemblies defer responses to a Parliamentary olive branch to a united response from the Continental Congress. Federal Writers' Project (1977). Rhode Island: A Guide to the Smallest State. US History Publishers. ISBN 9781603540384. http://books.google.com/books?id=bKHQOOx1eGEC. Brooks, Victor (1999). 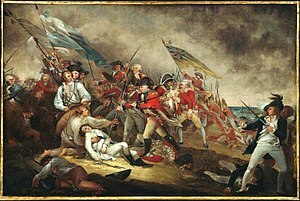 The Boston Campaign. Combined Publishing. ISBN 1580970079. Cushing, Harry Alonzo (1896). History of the Transition from Provincial to Commonwealth Government in Massachusetts. Columbia University. OCLC 4297135. http://books.google.com/books?id=lWNh3JjkbYAC. Fischer, David Hackett (1994). Paul Revere's Ride. Oxford University Press. ISBN 0-19-508847-6. French, Allen (1911). The Siege of Boston. McMillan. OCLC 3927532. http://books.google.com/books?id=PqZcY9z3Vn4C. Frothingham, Jr, Richard (1851). History of the Siege of Boston and of the Battles of Lexington, Concord, and Bunker Hill. Little, Brown. OCLC 221368703. http://books.google.com/books?id=Cu9BAAAAIAAJ. Frothingham, Jr, Richard (1886). The Rise of the Republic of the United States. Little, Brown. OCLC 2081524. http://books.google.com/books?id=-bUoAAAAYAAJ. Johnson, Allen (1912). Readings in American Constitutional History, 1776-1876. Houghton Mifflin Company. pp. 40?42. OCLC 502220. http://books.google.com/books?id=DMk9AAAAIAAJ. Raphael, Ray (2002). The First American Revolution: Before Lexington and Concord. The New Press. ISBN 9781565848153. Stephen, Leslie; Smith, George;Lee, Sidney (1886). Dictionary of National Biography: From The earliest Times to 1900. Smith, Elder. OCLC 2763972. http://books.google.com/books?id=cisJAAAAIAAJ. Chidsey, Donald Barr (1966). The Siege of Boston: An on-the-scene Account of the Beginning of the American Revolution. Crown. OCLC 890813.